CTET 2019 – Central Board of Secondary Education (CBSE) is conducting Central Teacher Eligibility Test on July 7, 2019. The admit card of CTET 2019 will be issued in June at ctet.nic.in. Application From Correction window closed on April 7, 2019. The national level teacher eligibility test has exam centres in 107 cities. CTET has two papers. Paper I is to teach class 1 to 5, and Paper II is to teach class 6 to 8. Get here complete details of CTET 2019 including exam date, syllabus, exam pattern, admit card, answer key, result. The minimum eligibility criteria in order to become a teacher is to qualify CTET. Candidates need to score 90 out of 150 to clear cut off. 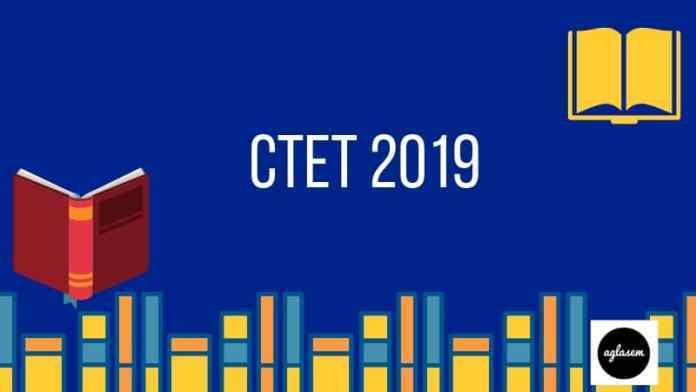 All events of CTET 2019 are as per important dates table below. The candidates whose application form will be submitted in the due date, will be issued the admit card for CTET 2019. The admit card for the examination will be issued on ctet.nic.in. The admit card will be available 02 weeks before the examination as per the last time experience. The only online mode will be active to access the admit card. Apart from the online, no other mode will be introduced for issuing the admit card. The candidates will have to enter the application number and password of CTET to download the admit card. After downloading the admit card it is advisable to check it once if admit card possesses any discrepancy then get it corrected by communicating CTET unit of CBSE. The candidates have to undergo the objective type of examination. The entire scheme of examination has been explained here. Duration: 2 hours and 30 minutes for normal candidates, 50 more minutes for a Differently abled person. Marking Scheme: +1 for correct and 0 for wrong and unattempted. CTET will be held for 20 languages. The candidates who want to appear in CTET 2019 examination can chcek the syllabus of examination. The syllabus is as per the last year information brochure. If there will be any changes in CTET 2019 notification, they will be updated here. As per the notification, the CTET 2019 examination will be conducted into 97 cities all across the country. The candidates have to choose the examination city in the preference order of 1, 2, 3. And Bord will allocate the center as per the candidate’s choice. The candidates will not be allowed to change their examination center. Any request to change the examination center will not be allowed. 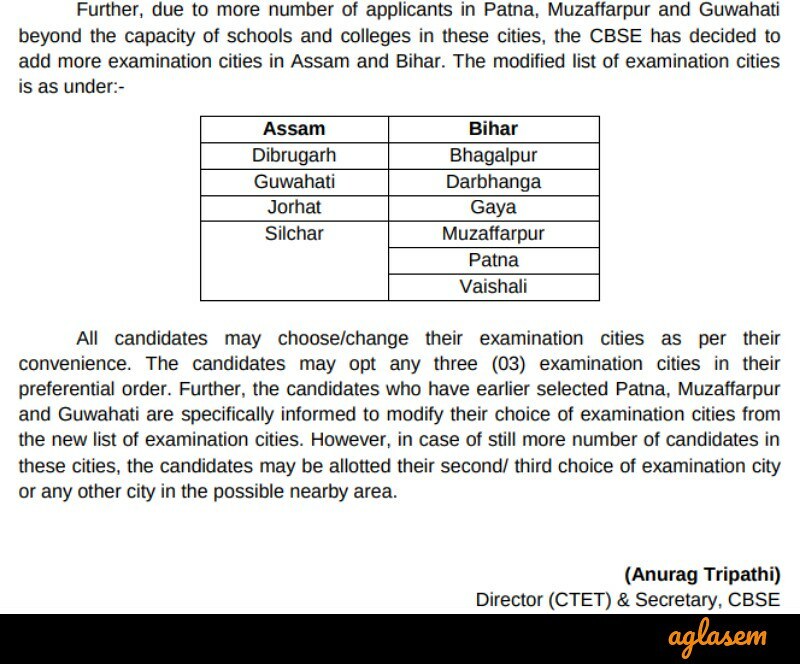 The CBSE has recognized more centers in Assam and Bihar for the conduction of CTET examination. The number of cities in which the examination will be conducted has been increased now. The name of cities in Assam which have been added in the center list. As soon as the examination will over the CBSE release the CTET answer key. The answer key will be released after 02 weeks of examination on ctet.nic.in. Along with the answer key the OMR sheet will be displayed as well. The candidates who will appear in the examination will check the answer key by entering the login credentials. CBSE will release the answer key for each paper and sets which will be asked in the examination. Along with the answer key and OMR sheet, the objection window will be open. The candidates will have to pay the objection fee Rs. 500/. The fee will be refunded if the objection raised by candidates found correct. As per the official notification of the CTET, the result is declared within the 06 weeks of examination. But in the last CTET examination, the result was announced within a month of examination. The CBSE will declare the result on ctet.nic.in. The result will be accessible through vital parameters in CTET case that will be the roll number of the candidate. The candidates who will obtain the more than or equal to minimum qualifying marks will be declared as CTET qualified and will be issued the Eligibility Certificate of that level in which he/she will appear. After a few days of result declaration, the marks statement will be shown through login. The CBSE has specified the minimum qualifying marks for CTET. The candidates who secure the marks beyond the line are treated as qualified in the examination. As per NCTE notification No. 76-4/2010/NCTE/Acad. A person who scores 60% or more in the TET exam will be considered as TET pass, i.e. they need to score more than 90 marks. However, there is no relaxation for the special category in qualifying marks. From the last exam of CTET onwards, CBSE issues Eligibility Certificate online through Digilocker. All the candidates who appear in the exam are assigned their marks statement in Digilocker. And all the qualifiers of CTET will be issued the TET certificate. CBSE itself creates the account of all appeared candidates in the exam and communicate then to candidates on their registered mobile number and email address. All you need to download the DigiLocker app and login with help of communicated credentials. The CTET candidates who have filled the form can edit their application form in case they have made any mistake in their form. While editing the application form the candidates are not allowed to edit all the fields in the application form. Hence the candidates have to provide all the details correctly in one go. This facility has been made available on the official website of CTET, ctet.nic.in. The candidates have to provide the login credentials such as registration number and password for making changes in the form. Only the online window will be available to edit the application form. Apart from this, no fax, no emails will be entertained regarding the correction in form. The interested and eligible candidates can apply for the CTET 2019 once the online application window opens. CBSE activated the application window on the official website of CTET, ctet.nic.in. The candidates can access the application form in the provided time frame. In order to complete the application form, the candidates have to submit the application fee. Online via Credit Card/ Debit Card/ Net Banking. It is mandatory to download the confirmation page after filling the entire application form. The CBSE is providing the chance to correct the mistakes in the application form, but still ensure that your application form should be submitted once without any error. This is to skip unnecessary problems. At last the candidates should download the confirmation letter of CTET application form. The candidates who meet the eligibility criteria laid by the CBSE can apply for the CTET 2019. Age Limit: There is no restriction on the age limit. The candidates who fulfill the educational qualification can apply. Educational Qualification for a paper I: The candidates who have completed or appearing in latest qualification (D.El.Ed / B.El.Ed / D.Ed Special Education). 50% minimum marks in class 12 and 2-year D.El.Ed. 45% minimum marks in class 12 and 2-year D.El.Ed. 50% minimum in class 12 and 4-year B.El.Ed. 50% minimum in class 12 and 2-year D.Ed (Special Education). Educational Qualification for a paper II: The candidates who possess these qualifications are eligible to apply for Paper II. 50% minimum marks in graduation and then 1-year B.Ed. 45% minimum marks in graduation and then 1-year B.Ed in accordance with NCTE. 50% minimum marks in class 12 and then 4-year B.El.Ed. 50% minimum marks in class 12 and then 4-year BA / BSc Ed or BAEd / BScEd. Graduation with minimum marks 50% and then 1-year B.Ed (Special Education). Educational Qualification For Paper I and II: The B.Ed qualified candidates can apply for Both papers.